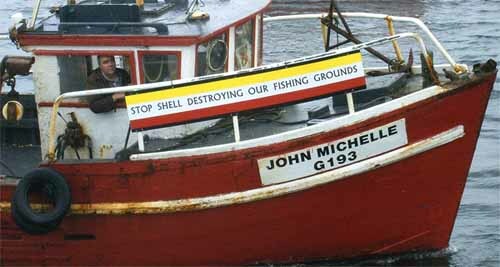 Shell Corrib Gas - Who are the real Thugs & Bullies? A number of high profile Shell to Sea campaigners including 'the Chief' Pat O'Donnell and Maura Harrington sought to appeal certain criminal convictions in cases heard last week at Castlebar Circuit Court from 9th - 11th February. A few of the appeals were successful but some of the convictions were upheld by the court. Judge Raymond Groarke concluded that Pat O'Donnell is a thug and a bully, and Maura Harrington is a vigilante. This article has a look at the reality. 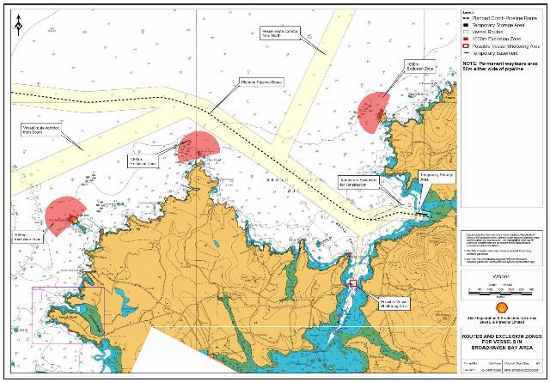 Shell plan massive maritime activity for 2010, in Broadhaven Bay to secure the off-shore pipeline, and in Sruth Fhada Chonn estuary to survey a new route for the onshore Corrib gas pipeline. Submissions on the foreshore application close on Feb 23rd. The offshore offshore Environmental Management Plan (EMP) gives details of Shell’s plans to lay concrete and rock over and around the off shore Corrib gas pipeline laid last year to fasten it in place. According to the plans survey work would be carried out during March and April, with the massive concrete and rock placing operation lasting from May right through to September. This afternoon in Castlebar Circuit Court, Shell to Sea campaigner and local fisherman Pat O Donnell (52) was sentenced to 7 months in jail after being found guilty of an alleged “breach of the peace” and allegedly "obstructing a Garda". In total 21 people appeared before Mayo courts today in relation to protests against the Corrib Gas Project. Fourteen campaigners appeared before Belmullet District court which were all adjourned until March, while seven were involved in appeal cases before Judge Raymond Groarke in Castlebar Circuit Court. Preview of appeals due in Castlebar on the 9th Feb 2010. Judge Rory MacCabe is due to hear 14 Shell to Sea related cases scheduled for next Tuesdays sitting of Castlebar circuit court. The stakes are high: Five people are appealing prison sentences imposed last year, and may go directly to jail if they lose their appeals. Despite the vindication of the campaign by An Bord Pleanála - who in November rejected over half of Shell's latest on-shore pipeline route on safety grounds – those who have rightly campaigned against the project over the years continue to be dragged before the courts, and may well be unjustly imprisoned after Tuesday’s court in Castlebar. Shell, along with the Government, Gardaí and judiciary would like the event to pass silently, people to go to prison quietly and serve as an example of what can happen if you stand up for your rights. From Wednesday the 27th to Sunday the 31st of January, the Rossport Solidarity Camp hosted a wind power workshop. 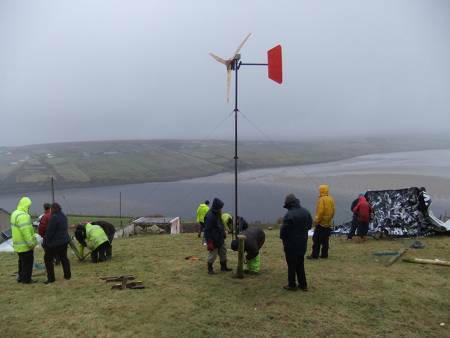 Local people and campers united to learn metal work, wood work and electronics to produce a fully functional 2.4 meter diameter wind turbine, now supplying power to the off-grid Rossport Solidarity House. The use of farmer's shed for the week was kindly by donated which was the perfect base for the workshop. The course was led by V3 Power, a workers co-operative based in Nottingham specialising in teaching courses in how to build DIY wind turbines.